In 1915 Grassy Glade, Florida, just across the bay from Panama City, Annie Laura’s birth daughter, Viola Lee has a good life. She keeps house while her adoptive mother runs a successful dry goods store, and is the apple of her adoptive father’s eye. She is only a week away from her dream wedding—the church is ready, and the dress is nearly complete. But things begin to unravel when her fiancé, James, does not return from his lumber camp deep in the piney woods of North Florida. A stranger interrupts Viola Lee’s long-awaited and much hoped for reunion with Annie Laura, revealing a secret that could threaten Viola Lee’s happily ever after. Despite struggles of her own, Annie Laura must go on a harrowing quest to right past wrongs and uncover the truth about James. Milinda Jay has created a vivid cast of characters in this story of tragic family secrets, love, longing, redemption, and ultimate triumph. 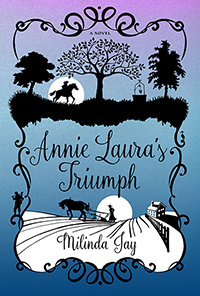 Never has a novel lived up to its title as ANNIE LAURA'S TRIUMPH. Milinda Jay brings to life a vivid account of a woman's struggle to fend for her family in the rough and tumble world of backwoods Florida. The historical details and page-turning plot make this novel a delight.